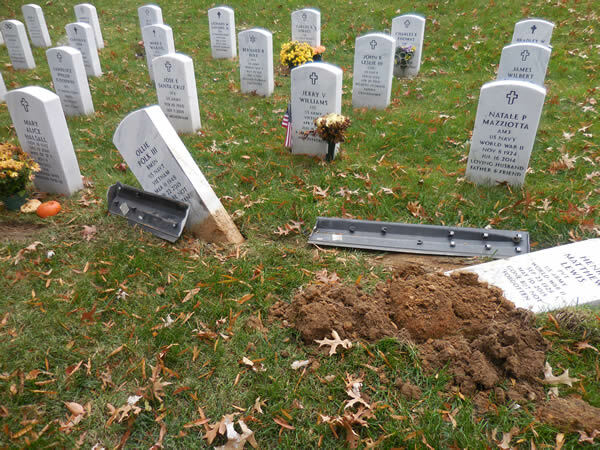 A car tore through the Alexandria National Cemetery at 1450 Wilkes St. last weekend, damaging six veteran headstones in the process, according to the Alexandria Police Department. The police department responded to a report of the damage shortly after 9:20 a.m. on Saturday, according to APD spokeswoman Crystal Nosal. APD has identified the driver and is investigating the incident. Nosal declined to identify the driver by name, as APD does not identify people until they have been charged. She also declined to speak to specific evidence of the incident. 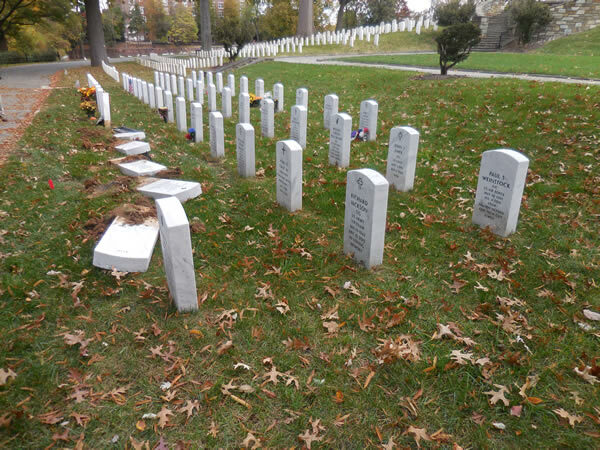 Alexandria’s VFW Post 609 shared information about the incident on its Facebook page. 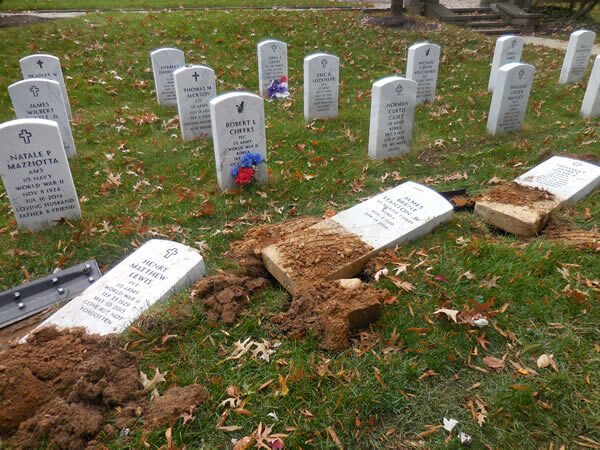 According to one of its trustees who the organization chose not to identify, six headstones were torn from the ground in a row closest to the road. 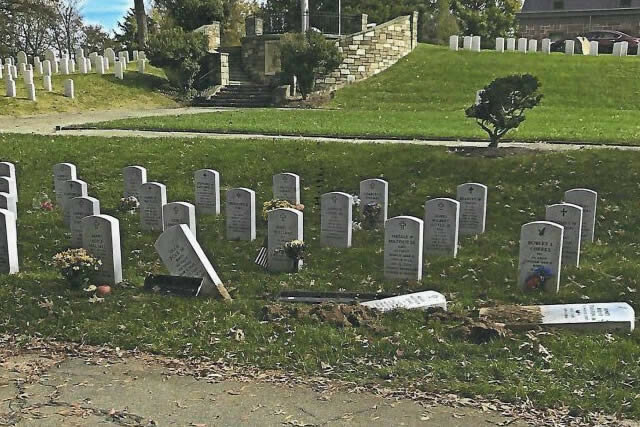 The trustee also reported that individuals from Quantico National Cemetery, the Alexandria Police Department and the Veterans Administration Police were on the scene of the incident. “The subject of erecting some sort of nighttime barrier was raised and discussed, to prevent this stuff in the future, but far too early for any decisions to be made,” the trustee wrote. 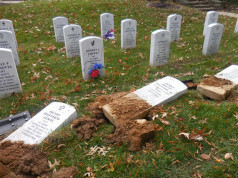 VFW Post 609’s post commander, Bill Jones, deferred comment on the incident to directors at Quantico National Cemetery. 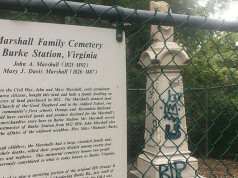 Mary Lipsey, a member of the Fairfax County Cemetery Preservation Association, also posted information and photos of the incident on the group’s Facebook page. 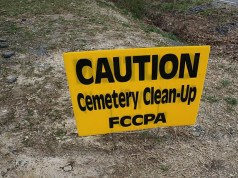 She said she saw the damaged stones, along with an abandoned car nearby with the keys in the ignition, upon arriving at the cemetery for the Wilkes Street Cemetery Complex Tour. Ned Foster also attended the tour and posted on Facebook. He posted a photo of the abandoned car and said police had dogs looking for a scent. Both Foster and Lipsey said the damage appeared intentional.